Read this, and like I do with most Brautigan, I found myself alternating between feeling "That's so beautifully written, I want to cry. Why can't *I* write like that?" 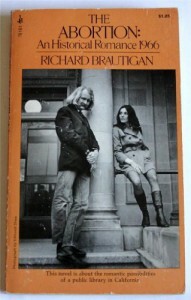 and busting out laughing at his subtle humor.I think people think Brautigan is that hippy-dippy "Watermelon Sugar" guy, but he really was a deeply gifted writer, I think if people read this and "Confederate General from Big Sur" they will definitely see what lies beneath the hippy surface.He is one of my favorite writers of all time, and this book is one of the reasons why.